Free ranging our poultry in season provides them with a natural diet of green food and bugs, and helps to satisfy their innate foraging instincts. In a natural environment, the ingredients to good health would be greens from pasture, bugs, grains, seeds, along with soil and stones, sunshine, and clean water. Yet with all that, how many of us have had to chase chickens out or fence our vegetable gardens to keep our marauding chickens from them? Or worse, had our flock chew up some of our prized flower beds? Well, truth be told, our poultry like a lot of what we like to grow and eat for ourselves. They like variety and they know those foods make them feel good from the vitamins and minerals they get from them. In our cultivated environments much of our plant diversity is becoming more limited on range for our flocks. But, it is possible to grow relatively easily successive, smaller gardens to supplement their feed during growing months. I have found growing foods for what my poultry specifically like to eat not only easy, but good not only for their health, but for the environment as well. With the exception of seeds, my poultry seem to prefer water-filled leaves and fruit meats. It could be how they naturally supplement their water intake. With the added vitamins and minerals, these "alive" foods are some of the most beneficial things we can provide for our flocks health. Unlike dried grains and soil, plants and bugs are living foods. Plants provide a multitude of minerals, macro and micro nutrients not found anywhere else. Even though I provide organic feed for my poultry and it is balanced with the essential nutrients, these ingredients are dry or inert. Offering fresh plant foliage will provide not only nutrients and water, but the different parts of the plant can offer different nutritional and medicinal values. Roots, stems, leaves, fruit, seeds, flowers are all edible and useful. The health and production of your plants will begin with the health of your soil. As a life-long gardener (and master gardener as well), I strongly recommend for some serious gardening, is to get a soil test done on your growing areas. These can be inexpensive tests provided through your county extension offices. For specific crops you want to grow, this test will not only tell you the physical composition (sand, loamy sand, sandy loam, loam, silt and clay loam, clay), but chemical composition like phosphorus, potassium, calcium, magnesium and the percent of organic matter within your soil. It has been my observation that poultry do eat dirt along with small stones for grit, and now you will know what they are getting from you soil! Nothing can be more frustrating than spending a lot of time and money invested in growing a garden, only to see your harvest die away or the yield to be too small for much good. Even with good soil, repeated gardening in the same areas will need replenishment. This is where composting your coop and pen bedding/litter will help by mulching and fertilizing your gardens each year. Also, you will need to be aware of your climate zone to know the length of your growing season and general temperatures of your climate. Not to worry if your soil leaves much to be desired! Raised beds and container planting (which can be preferable in some cases) are also options. You could also protect planted rows by a hoop of chicken wire over the row, which will let your flock pick through the wire without totally trampling or digging up the plant. If you have a greenhouse or lots of room in front of a sunny window in your home, you can grow in trays or containers year round. I have invested in some inexpensive plastic trays used in nurseries to grow some of the smaller annual vegetables like lettuce and shoots from grains. Successive plantings of fast growing annuals can be easier to manage in trays than in a big garden. You can offer up the whole tray for consumption, saving the work of picking from your garden. 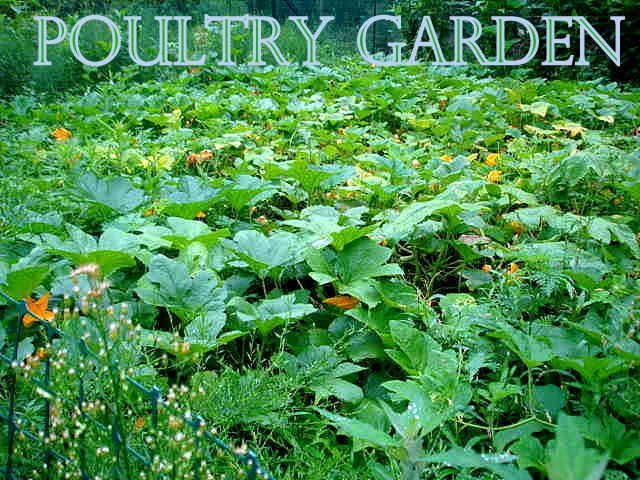 The last thing to consider is how you will feed the garden bounty to your poultry and what access, if any you will give them to your garden. There are a few options, and some might depend on how large your flock is, and your ability and means of how you will grow the food. The most obvious might be to grow a garden and let them access at will. Yet, poultry find young seedlings succulent and easy to pick and eat because of their size, and your garden could be over before it begins! A young garden may need to be protected until the seedlings get to be a foot high or more, unless you want them to eat the shoots. A fenced garden makes it easy to protect your plants until you are ready to let them eat. And this is one garden where native herbs (weeds) should be welcome! If you are not already familiar with the benefits of your native herbs, this can give you an opportunity to learn about what is there. A good native plant ID or field guide will serve you well. A last option is growing in trays and containers and offering when ready. My poultry have gone so far as to not only eat the plants, but the roots and dirt as well, consuming from shallow trays! The setup you offer will have to be something that will work for your flock size and environment to how and what you can grow. Leafy, succulent plants with small leaf or shoots (spears) seems to be a preference probably because of their relatively small size and therefore easier to eat. However, I have seen my flock tear away at larger leaves as well. There are lots of options, so for purposes of this article I will present examples of that you may incorporate directly, or use as ideas to apply to plants that grow well in your climate zone. Some of these examples are also particularly useful to poultry. As any gardener knows tender shoots appeal to our poultry as well as the older leafy parts of a plant. Young shoots of plants are highly digestive greens; a sort of "grown-up" sprout! At this stage maximum nutrition and minerals are concentrated within the young plant. Particularly, shoots from grains (such as wheat, oat, and rye) provide nice thick spears that poultry love. 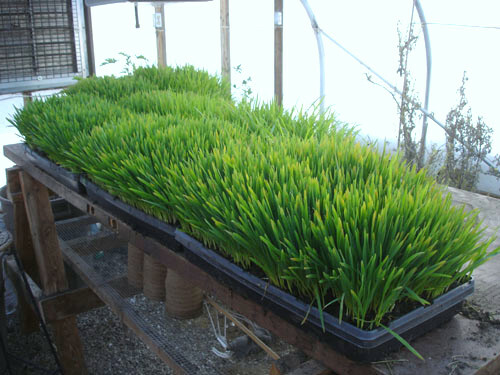 Offering plant shoots lend themselves to tray and container planting to provide a thick density easily administered. Once the shoots are about 4-6 inches high you can offer for feed, and plant again in successive plantings. My poultry will pull the shoot right out of the ground and eat the roots as well. One of the easiest vegetable plants to grow, with some of the juiciest leaves are from the species Lactuca sativa (lettuce), Eruca sativa (arugula), and Cichorium endiva (endive). What makes these plants so appealing for poultry is not only their high water content (70-95%), but the nutritional value as well. All these plants are high in Vitamins A and K, folates and Carotene-B, among other vitamins and minerals as well. Vitamin A and folates are important to a growing chicks’ bones and tissue development, while Vitamin K promotes good blood health. Vitamin A deficiency can cause respiratory issues in adults. The sowing rates of these plants can be done every 2-3 weeks, so successive planting can yield quite a bit of plant material for continuous harvesting. These plants are planted about 1” apart so are good for tray or container planting. Parsley is another important leafy plant (species Petroselinum) that has a lot to offer not only nutritionally, but medicinally as well. Parsley is not only even higher in all the nutritional value, but is also high in Vitamin C, copper and iron. Not only is it antimicrobial in action, but also has choline which is an important nutrient for egg-laying production and another good nutrient for a growing chick. Although parsley is slow to germinate, it can be grown indoors in a container all year round. Mustard (species Brassica) has a three-fold use; nutritional, medicinal and a soil disinfectant. Mustard is also comparable to all the other leafy vegetables mentioned as far nutrients, but also an important tonic as a digestive aid and the seeds can be used as a worm expellant. Bio fumigation uses crops like mustard (along with cabbage, radish or sorghum) which release chemicals when decomposing which is said to kill nematodes and fungi and other soil borne pathogens when mixed into the soil. Mustard is another quick germinating seed which also works with successive plantings which can grow well into the late fall. Fruits have to be the most favorite food of poultry. I have never seen a bird that won’t gulp down a berry fruit. 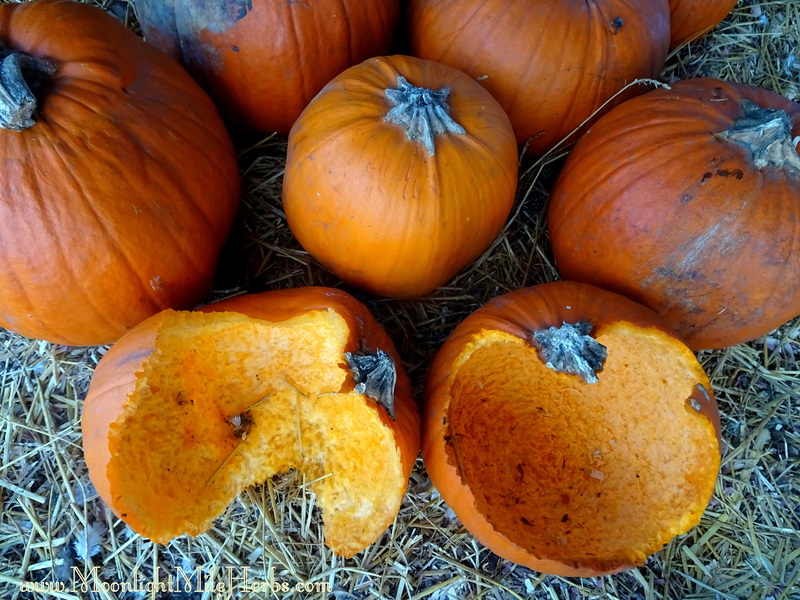 Botanically speaking, fruits also include pumpkin, squash, cucumbers and tomatoes, of which I have witnessed them all eaten completely, including the rinds. My flock also likes strawberries and huckleberries which grow wild. Fruits are usually high in phytonutrients, rich in vitamins A, C and E and minerals, including calcium. During laying season, hens will eat much less feed because they need less energy to stay warm. But their nutrient requirements increase for egg production, especially calcium. Formulated laying rations are made with increased vitamins and minerals, with more than what is needed to make sure hens get the nutrients they need. If you use organic feed or mix your own, you need to insure your hens are getting proper nutrition. A healthy hen is needed not only to have a good hatch rate, but it will largely determine the health of the new chick. Huckleberries offer digestive support. Strawberries and tomatoes are high in Vitamin C and minerals, of which it is reported Vitamin C can help chicks manage their considerable stress and provide hens help with egg production rates. The Cucurbitaceae family (pumpkins, cucumber, squashes and watermelon), have an affinity in many of this family’s seeds that can help expel worms, ranging in strength of effectiveness. All these fruits lend themselves to fenced gardens, which you can allow access to your flock once the fruit is ripe. Pumpkins, watermelon, squash and cucumbers will need room to grow because they are vine plants and travel by runners on the ground. My flock is so used to eating pumpkins, they will peck right through the rinds to get to the fruit meat and seed, and eventually eat it all. You may have to cut or crack open those with tough skins to begin with until they get used to eating them. And if you can tomatoes, your poultry will love the skins, seeds and cores left behind. Feeding your poultry green foods are not only nutritious and cost effective, but also will supply diversity to your ecosystem. A side benefit to growing gardens is that they will be beneficial to good bugs and the honey bees in your environment. Some of these plants may also help improve your soil. What can be better than sharing a handful of strawberries with your flock at the end of the day!